8 INSPIRATION [title inside three compartment bubble] AIR WONDER STORIES [centered] WINGS WERE NEW In July 1929, just one month after the first issue of SCIENCE WONDER, Gernsback started still another science-fiction magazine, one devoted to the future of aviation. 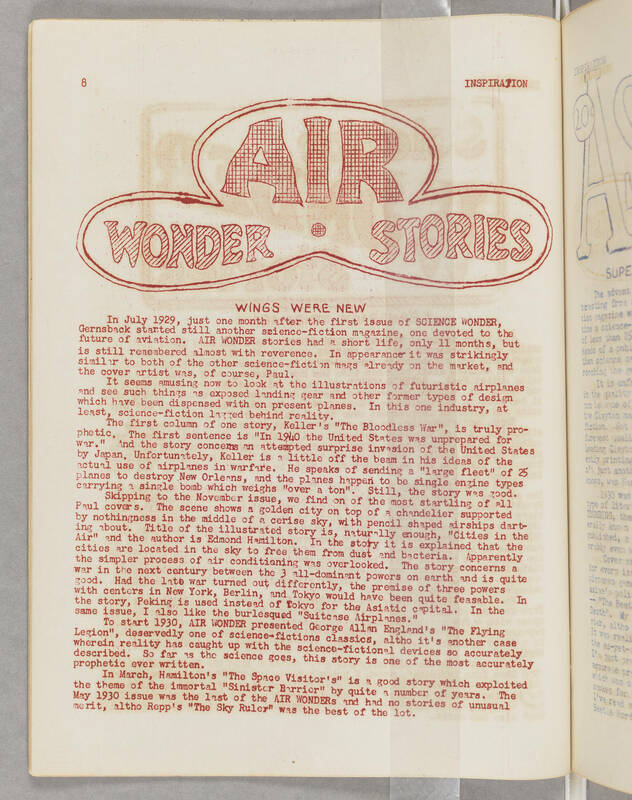 AIR WONDER stories had a short life, only 11 months, but is still remembered almost with reverence. In appearance it was strikingly similar to both of the other science-fiction mags already on the market, and the cover artist was, of course, Paul. It seems amusing now to look at the illustrations of futuristic airplanes and see such things as exposed landing gear and other former types of design which have been dispensed with on present planes. In this one industry, at least, science-fiction lagged behind reality. The first column of one story, Keller's "The Bloodless War", is truly prophetic. The first sentence is "In 1940 the United States was unprepared for war." And the story concerns an attempted surprise invasion of the United States by Japan. Unfortunately, Keller is a little off the beam in his ideas of the actual use of airplanes in warfare. He speaks of sending a "large fleet" of 25 planes to destroy New Orleans, and the planes happen to be single engine types carrying a single bomb which weighs "over a ton". Still, the story was good. Skipping to the November issue, we find on of the most startling of all Paul covers. The scene shows a golden city on top of a chandelier supported by nothingness in the middle of a cerise sky, with pencil shaped airships darting about. Title of the illustrated story is, naturally enough, "Cities in the Air" and the author is Edmond Hamilton. In the story it is explained that the cities are located in the sky to free them from dust and bacteria. Apparently war in the next century between 3 all-dominant powers on earth and is quite good. Had the late war turned out differently, the premise of three powers with centers in New York, Berlin, and Tokyo would have been quite feasable. In the story, Peking is used instead of Tokyo for the Asiatic capital. In the same issue, I also like the burlesqued "Suitcase Airplanes." To start 1930, AIR WONDER presented George Allan England's "The Flying Legion", deservedly one of the science-fictions classic, altho it's another case wherein reality has caught up with the science-fictional devices so accurately described. So far as the science goes, this story is one of the most accurately prophetic ever written. In March, Hamilton's "The Space Visitor's" is a good story which exploited the theme of the immortal "Sinister Barrier" by quite a number of years. The May 1930 issue was the last of the AIR WONDERs and had no stories of unusual merit, altho Repp's "The Sky Ruler" was the best of the lot.